I have been quite intrigued by the stories and pictures shared with me by my colleagues from India, who experienced their own traditional Assamese Hindu Wedding, and numerous others of their family and friends. Marriages in India used to be arranged by the parents of the future bride and groom, but this practice has lessened considerably now, and the “in love” marriages are becoming more popular. However, the parents from both sides still play a very prominent role in learning about each other families and providing the final approval and blessing of the marriage of their children. Marriage in India is considered very sacred, as it is not only a union of the two people getting married, but also the union of the two families. The courtship between the couple to be married, is fairly short, in comparison to the American tradition, as they usually get married within less than a year’s time from the beginning of their courtship. In a traditional Hindu Wedding, family members of the prospective bride and groom, make arrangements with the priest for an engagement date called “Misri”. This date is carefully selected, taking into account the celestial alignment of the stars, the sun and the moon. The rings are usually purchased by the parents of the future bride and groom, and given to them as a gift. This tradition is not practiced by the Assamese, however, they may receive rings as a wedding gift, but these are not exchanged as a part of their marriage vows, as it done in the US. I will elaborate on this subject, in a later post. There are numerous wedding traditions, depending on the different religion being practiced and different geographic location of the bride and groom, as well as the caste, each family is a part of. Most of the time, the bride and the groom are of the same religion, geographical location and caste. However at times this might not always be so, in which case, their two different traditions are incorporated into one, and carried out during the wedding ceremony. There are no wedding showers practiced in India, however the bride and groom’s family shower them with gifts in one of the pre-wedding rituals, as you will learn from my future posts. Also, the guests attending the wedding reception, bring gifts to the bride and the groom. There is a very interesting tradition associated with the wedding invitations, as there are two or even three different kinds of wedding invitations. 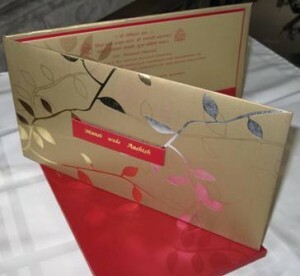 There are very formal wedding invitations, for the parents, grandparents and very close friends. 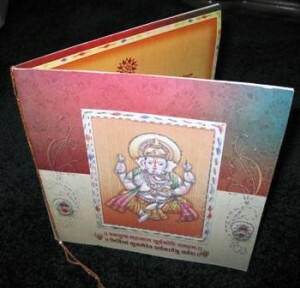 These invitations are quite elaborate in style, texture, and artistry. Most of these invitations are personally hand delivered, by the future bride and groom, with additional personal invitation warmly extended to these guests. The invitation I am displaying here, resembles an award like document, with silk cloth covering the padded, hard cover, two-fold invitation, imprinted with gold lettering, and three dimensional, box like, matching envelope, which basically resembles an over-sized, top of the line, chocolate bar. Then, there are less formal invitations, for the more distant family members and casual acquaintances. These would normally be mailed out to these guests. And last but not least, there are very informal invitations, via phone, email, or even very casually mentioned for their numerous everyday friends. Indian weddings last from 3 days to a week. Normally they are scheduled during evening hours, and consist of over a thousand of guests at the reception, but mostly very close family members attend the actual marriage ceremony. All other guests only attend the reception, which resembles an open house party, where the guests stop by to greet the bride and the groom with well wishes, drop off gifts, help themselves to a bountiful buffet style meal, and leave the reception shortly afterward. The usual attire for the bride is a red, or red and white sari, modestly draped over her head, and the groom wears a Kafni and Pijamo, which is a long shirt extending to the knees, and special leggings. The women guests normally wear sari, and the men wear suits. However it is traditional to wear sandals or other type of slip-on shoes, as one needs to be bare footed to be able to enter the Mandap, a canopy like structure, elaborately decorated with flowers, equipped with benches, and a special place for a sacred fire is set up in the middle, where the actual marriage of the bride and groom takes place. As I mentioned before, only closest family members take part in the actual marriage ceremony. Indian weddings are very joyous, full of frolic, color, and numerous secular and spiritual rituals. There are pre-wedding, actual marriage, and post wedding rituals, which I will share with you in the next few posts, accompanied by many colorful pictures. My friends Rishi and Ria, celebrated an Assamese style Hindu Wedding, and were kind enough to share their wedding pictures and many of the traditions and rituals included at their wedding. Stay tuned, and you will most definitely expand your knowledge about the Indian culture, and Assamese style Hindu Weddings. Wow that is a lot of information you found about the hindu wedding. I love the invitations and the whole celebration. Im glad to hear that there is more love and getting to know each other in the relationship than just having the parents choose a partner for you. Nice post SG. I will be posting at All Women Stalk soon, Ive been emailing them about writing again! 🙂 Have a great holiday. Diana, so nice to hear from you. 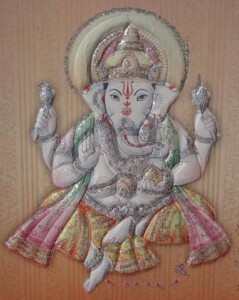 Yes, the Hindu Weddings are very rich in rituals and tradition, so there actually is 3 more posts about this event. I found it very interesting, and now I appreciate it so much more. Hopefully you will be able to read the rest, as you will notice some very intersting differences in comparison to American weddings. I am happy to find so many interesting Hindu wedding ceremony here in the post. thanks for sharing. I had lots of fun researching some of this information and mostly getting it straight from my friends who had this type of a wedding ceremony. I am glad you enjoyed the posts. Thank you for stopping by my blog and for your lovely comments.